Back to school and ready to give back. Round up parents, friends and family! Although you may find your fabulous finds of backpacks at Target and the newest jean trends at T. J. Maxx, why not be the one to add a little extra flair? With our expansion of Erika Walton Jewelry dino earrings, you now can wear your mascot to show your school pride, rep your favorite animal or show your support for the marine life. After fashionably accompanying your ensemble with a furry friend on your ear, what next? Erika Walton Jewelry is going to be giving back to schools! That’s right. You heard it hear first. You have gone door-to-door selling magazines, gift-wrap and Tupperware. Now it’s all about the schools and their arts programs. We are preparing our first ever fundraiser to help schools have more money so arts programs do not need to be cut! Let us know if you think your school (or alma mater) would be interested in participating. Nothing like a fun, friendly competitive game of who can sell more. Check out some of our animal, not on our website. 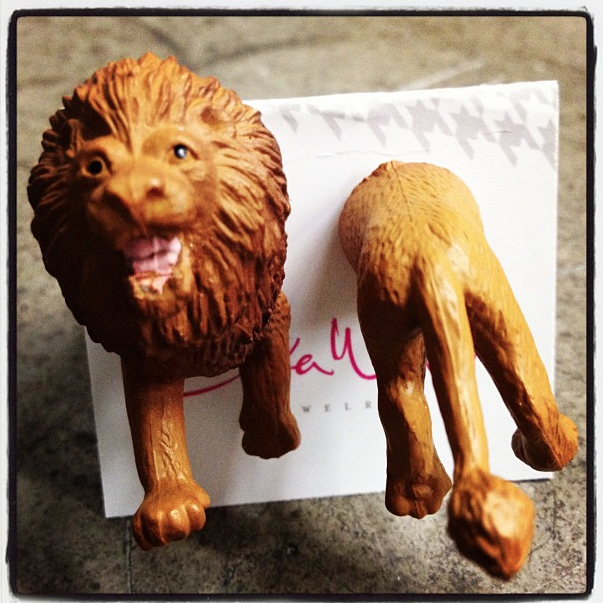 Whether you are a lion lover or the leading lion school, contact us to be one of the first to own this fierce piece. Like us on Facebook, send us a message, and we will ship it to you for free!